Yemen, the poorest country in the Middle East, is in the midst of a massive humanitarian crisis. Deadly clashes and airstrikes have forced over 3.1 million people to flee their homes since March 2015. As many as 21 million people are in need of humanitarian assistance, a shocking 82 percent of the population, and 14.1 million people cannot afford enough food for their families. The worst cholera outbreak on record is also occurring there. Since April 2017, there have been over 600,000 suspected cases. Oxfam has been in Yemen for more than 30 years, working with government authorities, as well as civil society organisations, to improve the water and sanitation services and the livelihoods of thousands of people living in poverty. Our focus is on women's rights, healthcare, disaster preparedness and helping people to have a say in the decisions that affect them. Delivering humanitarian aid in Yemen Oxfam in Yemen Peace talks and a partially observed cease fire ended in August. Since then the airstrikes and violence has only intensified. Oxfam has been delivering essential aid to those affected since July 2015 and has reached more than 1 million people with clean water, food vouchers, cash transfers and hygiene kits. Peace talks and a partially observed cease fire ended in August. Since then the airstrikes and violence has only intensified. Oxfam has been delivering essential aid to those affected since July 2015 and has reached more than 1 million people with clean water, food vouchers, cash transfers and hygiene kits. Yemen’s humanitarian crisis has left the economy in tatters. Almost half of the population is unable to access the food they need to survive and millions of children are malnourished. Millions have been pushed from their homes and out of work, while food prices continue to rise. The lack of progress in reaching a peaceful outcome is deepening the cycle of poverty and suffering across the country. Oxfam is providing agricultural and humanitarian assistance to help people recover from the crisis and prepare for the future. We’re empowering women to play a role in their country as we push for peace to be restored in Yemen, so that the future generation can live free from war and conflict. 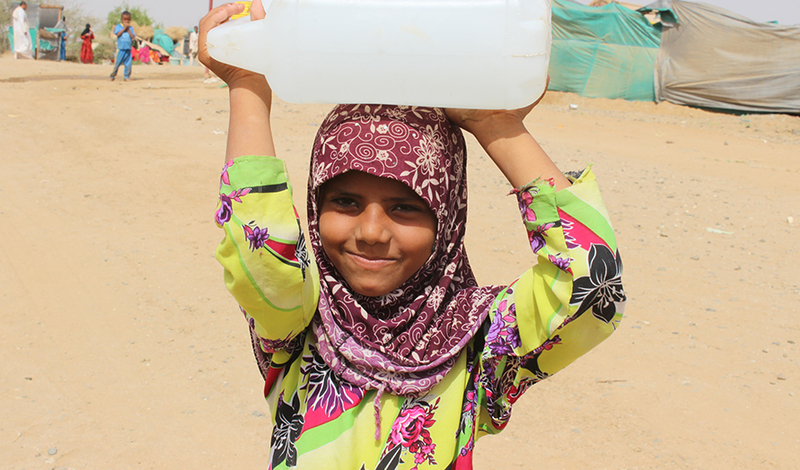 Farah* (8) collects water from an Oxfam water distribution point at the Al-Manjorah refugee camp, Bani Hassan District, Hajjah, Yemen. Credit: Moayed Al-Shaybani/Oxfam *Names changed to protect identities.